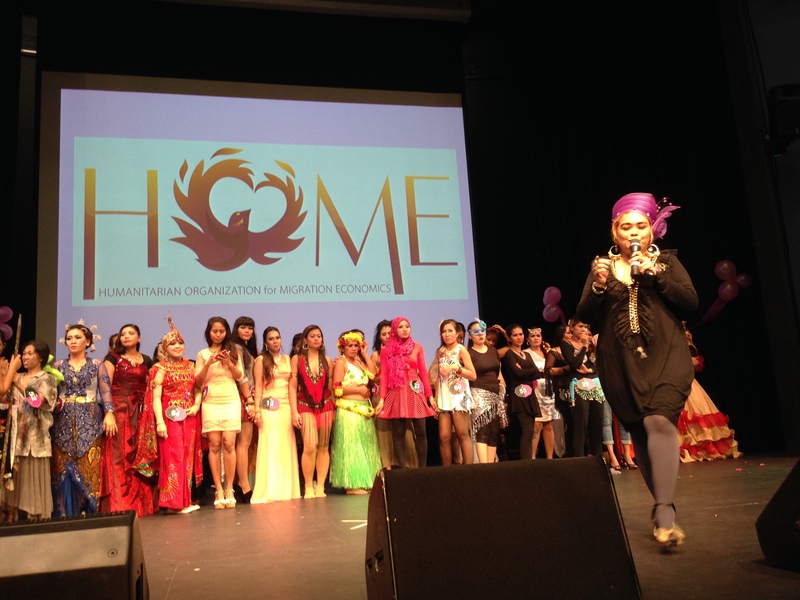 In June this year HOME hosted the HOME Talent Pageant 2014, a unique pageant, that focuses on skills rather than beauty, and that aims to show that domestic workers have many other talents aside from cleaning and cooking. Six months after the event, we wanted to see how joining this pageant has shaped the life of its contestants. 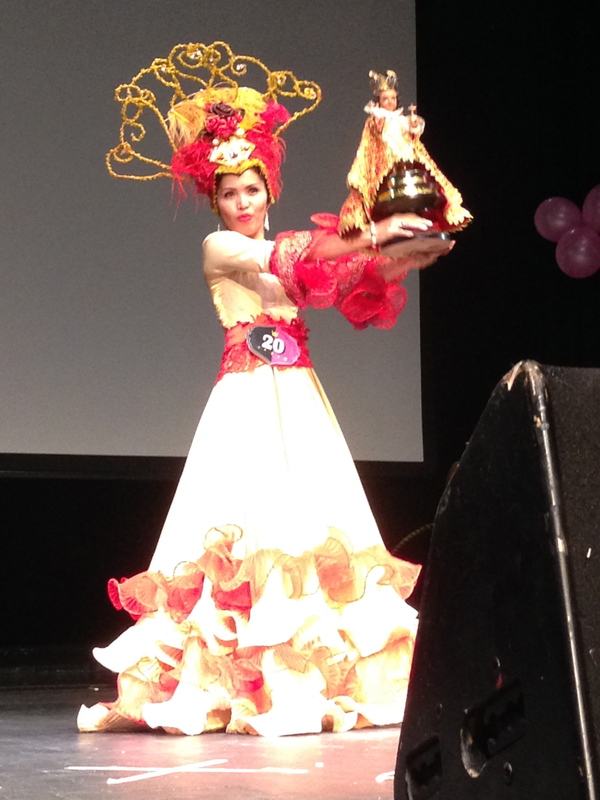 We asked HOME Talent Pageant 2104 winner, Enok Sunani, to share her experiences on the HOME blog. My name is Enok Sunani, and I come from West Java, Indonesia. In September 2001, I landed at Changi airport to work in Singapore as a domestic helper. Back in Indonesia I never had the chance to attend school for financial reasons, so I took the opportunity to upgrade myself while I was in Singapore. I completed a computer course with HOME, and started English classes as well as courses in entrepreneurship. Sisi Sukiato, who works for HOME, was the first person to ask me to join the HOME Talent Pageant. At first, I said no to her. I was very shy, and did not have confidence in myself. I am very short (petit), and I have a rather dark skin complexion. But Sisi told me I should try and make my country and fellow foreign domestic workers proud. So I was the first to register. At the time I registered for the HOME TALENT PAGEANT, I had just completed my first course. I started volunteering for HOME, in the HOME MUSICAL group, and was keen to help out at the English classes as a teacher, or assistant teacher as soon as I had my certificate. Then, I got caught up in the excitement of the pageant. 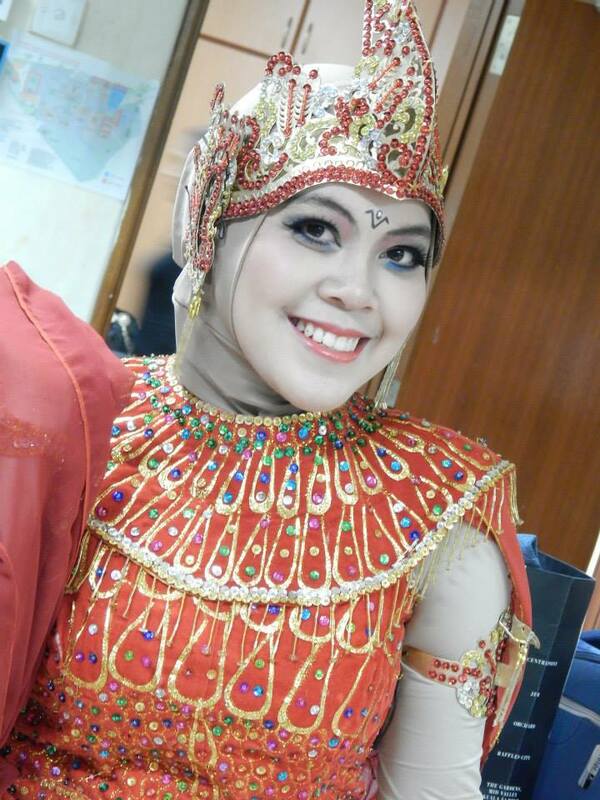 Now the pageant is over, but for me, it is just the beginning. Last July, I performed on stage with HOME KARTINI MUSICAL at the Hari Raya Mega Bazaar to raise funds for the needy Singaporean. We were all very happy to do this, even though we were all busy and fasting at the time. I am really glad I joined the HOME Talent Pageant. What I liked most about the pageant was getting the chance to meet people from different backgrounds and communities. And off course, the sessions where we learned how to walk on a catwalk were great. I had never worn high heels before! We got to work with exciting people like supermodel Hanis Hussey, and performer Pamela Wildheart. These ladies have become great inspirations for me, and I really appreciate all their hard work, and that of Cristina Santos who was always there for us during our practices. And off course, I should not forget the HOME Talent Pageant committee, who are the unsung heroes behind the successful pageant. The committee, all foreign domestic workers themselves, was so friendly, kind and supportive. I salute all the candidates and committees for being professional and hard working! During the HOME Talent Pageant I have learned to work with different people in the group, and found that communication was really important as we were all from different communities. I never knew I could do all the things I did onstage, and getting to know what my talents are is just the best thing that ever happened to me. I have gained a lot of confidence, and have even started to wear high heels more often now. What made me even happier is that and I was able to teach other candidates, and that I could practice whilst sharing what I had learned. To me winning means achieving what you set out to accomplish, either personally, or as a part of a team. The X factor. American Idol. Idols. Britain’s got talent. America’s got talent. Who does not know them? But Singapore’s got talent, who’s heard of that? The city-state is not known for it’s creative excellence. Does Singapore have talent? 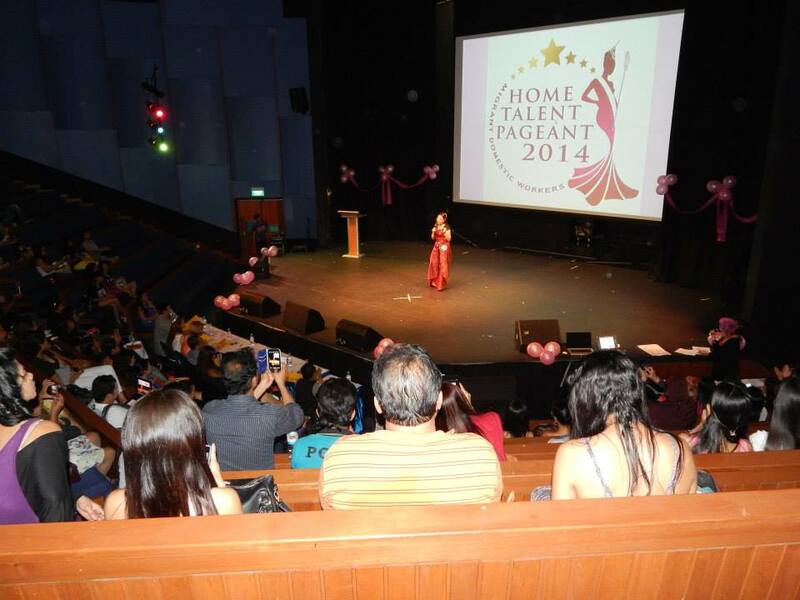 This weekend, I had the honour of being a judge at the HOME Talent Pageant 2014. 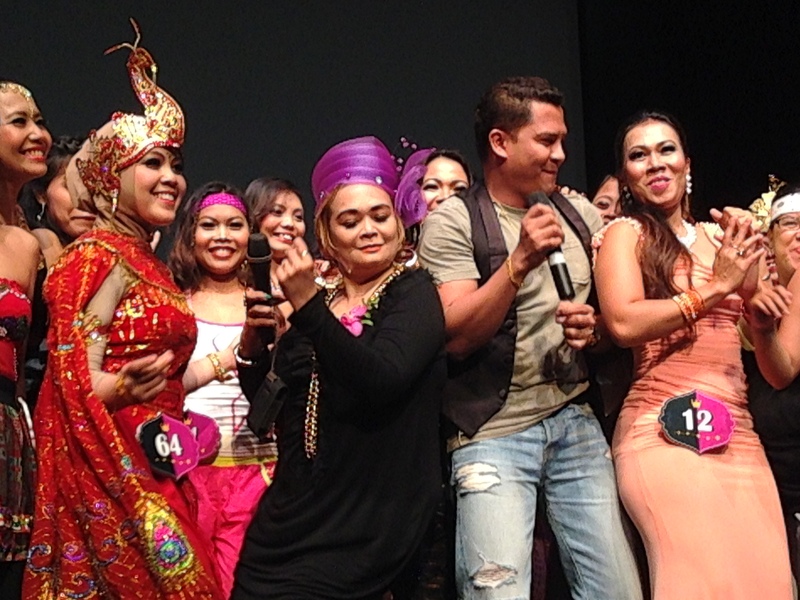 The pageant is open to a very special group of Singapore residents: Foreign domestic workers. These brave women leave their home’s behind to take care of other peoples homes overseas. They live in their employers houses, have long working hours, and often not even a weekly day off. No wonder HOME felt these amazing women deserved to be in the spotlights for once. 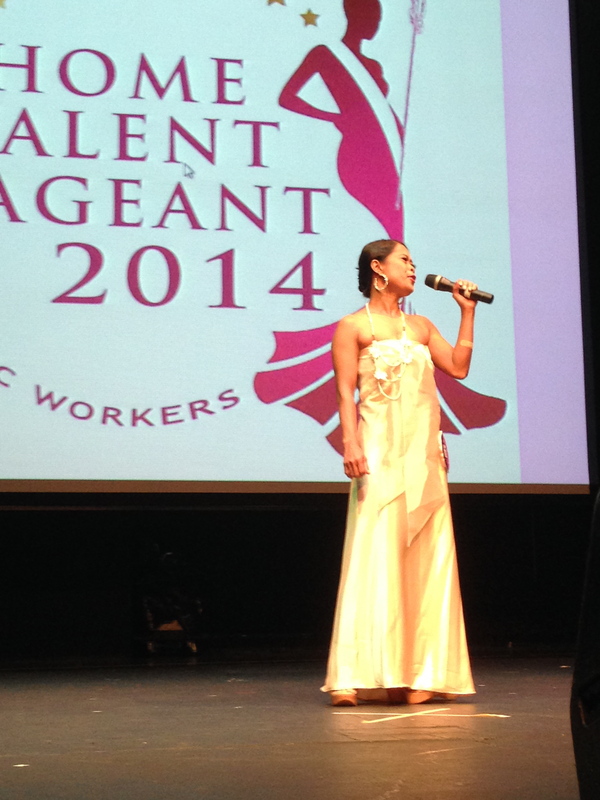 UWC’s Dover campus hosted the semi finals, the talent part of the pageant hosted by the amazing Pamela Wildheart. With the other judges I sat, slightly nervous, in anticipation of the day’s events. We would have to judge the contestants women from mostly Indonesia, the Philippines and India on attributes including stage presence, uniqueness, skills and emotional impact. HOME’s talent pageant not about body shape, age, race, weight. It is about inner beauty. Grace and charisma. Focusing on skills rather than beauty, the pageant hopes to encourage domestic workers develop their talents, and pick up life skills whilst working in Singapore. HOME Talent Pageant 2014 was organised by HOME domestic worker volunteers, giving them the opportunity to showcase their talents off-stage as well as on. Embracing my inner Simon Cowell, I sat in eager anticipation of the contestant’s performances in the first category, singing. Just like on TV, not all the contestants managed to hit the right notes all the time, but dedication, beautiful costumes and poise more than made up for that. In the special acts category, we heard declamations about the strife of foreign domestic workers, percussion, even dressmaking and make-up skills were demonstrated on stage. Doling out points became harder with each new contestant. How do you compare a lady dramatically acting despair to one performing a traditional Indonesian chant, or one swirling a hula-hoop on her neck? The most popular category was dancing, and wow, these ladies can shake their hips! We saw Shakira, belly dancing, hip-hop, traditional Philippines sarong dances, classical Javanese dance, pop, zumba, tribal dances, and much, much more. During the counting of the votes, the audience was treated to performances from fellow judges Gerson Lapid Jr, and Robert ‘Obet’ Sunga. Young music student Neil Chan made the hearts of many contestants’ race, with young ladies swarming around him to get their pictures taken. In the meanwhile I, the writer with the singing capacities of a peanut, hid in a corner. Fifteen finalists were selected, each of them demonstrating that domestic workers are capable of more than cleaning washing, or taking care of the elderly. They are women of many talents. I hope that the HOME Talent Pageant 2014 will teach Singaporeans how unique and special their foreign domestic workers are, and that these women deserve the right, opportunity and time off to further develop their skills and talents. The HOME Talent Pageant 2014 final will take place on Sunday, the 29th of June 2014 from 1 to 5pm at the Catholic Junior College Performing Arts Theatre, 129 Whitley Road Singapore. Tickets are available at 20 dollars each.